A lot of us in the U.S. have the tendency to refer to the 12 days of Christmas as the 12 days before Christmas. That’s a bit weird to many people, but do you really care when you’re getting free books out of the deal? No, you do not. For the next twelve days, Torquere Press is giving away ebook copies of one or two titles through their website all day every day. I’ll be posting them here so that you can make sure to grab them. Today’s giveaways are Alyx Shaw’s A Strange Place in Time and A. Catherine Noon and Rachel Wilder’s Emerald Fire. Raised in a motorcycle gang, John Arrowsmith has a bad case of wanderlust. He’s not sure what drives him, but he knows he has to go, and he has the perfect machine to ride on; the big custom bike he calls Harley. When he and Harley get run off the road and wake up someplace completely unfamiliar, Arrowsmith knows something has gone pretty darned wrong. With a cast of characters that include thieves, Moonhounds, and ogres, John has to find his way through this new world, trying to understand why he’s been transported there, and why he’s falling for a guy named Infamous. 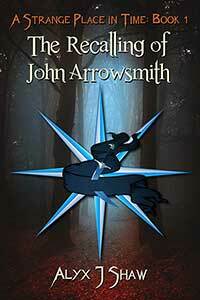 What Arrowsmith finds out surprises him, and might just kill him. Can he survive to find his way home? The harsh desert world of Persis has developed its own customs far from Old Earth. Keepers are cherished as caregivers and helpmeets to Hunters. 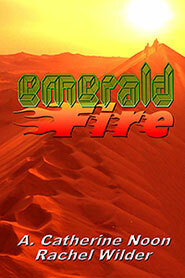 During Emerald Keeper Teeka’s first Contract with Senior Hunter Brant, disaster strikes. Brant is killed and Teeka is stranded, surrounded by strangers, and unsure of who to trust. A dark and moody Hunter steps forward with an offer of partnership and protection. Teeka wonders what motivates the scarred and solitary Senior Hunter Quill. Both have hidden motives for agreeing, and both are suspicious of each other. But the Great Valley will force them to work together and build a trust born out of necessity and survival. Between the dangers of the harsh desert and the malice of a hidden enemy, Teeka and Quill must learn to believe in each other to find the truth.